The term Flachgau is a vernacular one referring to the administrative district Salzburg-Umgebung (Salzburg Surroundings). The Flachgau comprises of the province′s most densely populated areas outside of Salzburg city and of a landscape of fertile, gentle hills with few mountains in the border to the Tennengau area. Traditionally, the Flachgau was the area with the wealthy farmers, the bread basket (or milk barrel?) of the province. Especially since the 1970ies, the villages and towns of the Flachgau have grown tremendously and transformed most of them into effective suburbs of Salzburg. This was accompanied with a transition of the communities; there is surprisingly little tourism in the Flachgau region, as most sightseeing happens in the city, most hiking in the Salzkammergut and most skiing in the Alpine south of the province. The Flachgau has a total population of approximately 145,000, roughly the same as the city of Salzburg. This means that Flachgau and city of Salzburg combined hold more than half of the total population of the Salzburg province. There are lots of commercial areas in the Flachgau and the region is doing well economically. It includes shopping havens like Wals-Siezenheim. In terms of tourism, those parts of the Flachgau that belong to the Salzkammergut gain the most attention, especially the town of St. Gilgen, which is popular throughout the year. Fuschl is rather a summer destination. In the north of the Flachgau, there are several lakes, as it is a typical ice age landscape. These lakes of the "Salzburger Seenland" (Salzburg Lake District), though pretty, are popular mostly with domestic and German tourists. 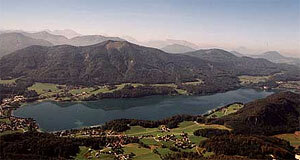 Other international visitors seem to prefer the Salzkammergut, of which the Flachgau has a share. In terms of sightseeing, the folklore museum of Großgmain and the Silent Night Chapel of Oberndorf are probably the only sites of international "fame" in the Flachgau. The area of Gaißau-Hintersee is not the only, but the only noteworthy skiing area in the Flachgau. The main seasons of the humble Flachgau tourism, however, correlates with those of the city and peaks during the Salzburg Festival in summer. At this time, visitors of the festival who want to stay close to the lakes often choose hotels in the city′s surroundings. There are three cities in the Flachgau (Neumarkt, Oberndorf and Seekirchen); there are also six market towns (Grödig, Eugendorf, Mattsee, Obertrum, Straßwalchen and Thalgau). In addition, the Flachgau has the following other municipalities: Anif, Anthering, Bergheim, Berndorf, Bürmoos, Dorfbeuern, Ebenau, Elixhausen, Elsbethen, Faistenau, Fuschl am See, Göming, Großgmain, Hallwang, Henndorf am Wallersee, Hintersee, Hof bei Salzburg, Koppl,	Köstendorf, Lamprechtshausen, Nußdorf am Haunsberg, Plainfeld, Sankt Georgen bei Salzburg, Sankt Gilgen, Schleedorf, Seeham, Strobl and Wals-Siezenheim.